Part of the San Luis valley. View from satellite (true colour image). 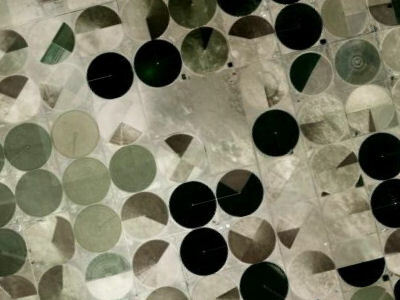 By combining the different bands of satellite images taken at different dates, it is possible to classify every pixel of the image and assign it to a crop type. This process of assignment is called image classification. It is a very time-consuming task, requiring many calculations. Fortunately, image processing software are equipped with algorithms that can deal with this workload. 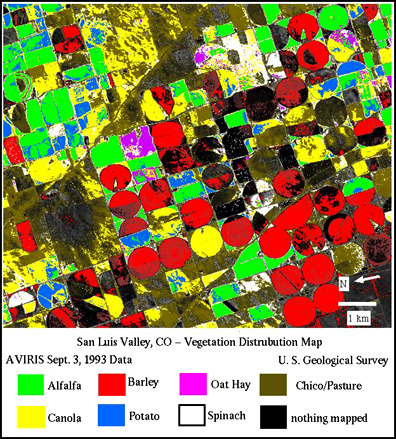 The software takes into account all the available bands, groups pixels with similar "spectral signatures" in the same class, and then uses the vegetation cover information to identify the crop types. The result of such a classification can be seen on the image on the right. For this particular example data from a sensor called AVIRIS were used. These data were collected while the sensor was mounted on an aircraft (not a satellite). Airborne data have the advantage of high spatial resolution (usually around 1 metre for each pixel) and airborne sensors usually have many bands. In addition it is up to the user to choose when the data will be collected (as opposed to the satellites, which usually have a very fixed orbit plan). Image classification showing the various crop types. By using multi-date data (data from different dates) from one growing period, it is possible to identify the different crop types, because the vegetation cover of each crop changes at different rates. In addition, the planting and harvesting dates are also different. By combining this information with remote sensing data, we can discriminate between different crops and also identify them. However, we have to take into account the possibility that a crop is under stress, which changes the way the canopy reflects radiation. In this case it is easy to identify a crop as different crop. The chance of this happening is reduced if we have remote sensing data from more than two dates in one growing season.